The Damsel Nymph is an important food for bass and panfish during the summer months. 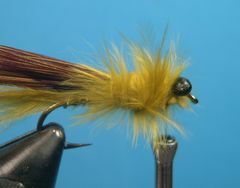 This Marabou Damsel Nymph is the first in a series of three patterns that I favor. The Damsel Nymph is a very important food source for panfish and bass. Fish biologists have found that during the months of June, July, and August, the most common food item in the stomachs of bass - both smallmouth and largemouth - as well as bluegills, perch, and other panfish was a mix of damsel and dragon fly adults and nymphs. Biologists have also noted that minnow eaters like crappies, walleyes, and even northerns, had a fairly large percentage of damsel and dragon fly nymphs in their stomachs. As you begin to see damsel and dragon flies on your favorite pond, tie on a Marabou Damsel Nymph and fish the weed lines where the real nymphs live. 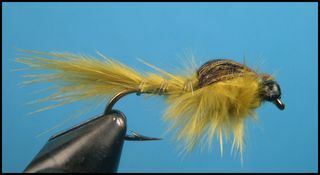 The Marabou Damsel Nymph is an easy fly to tie. The tail, body, and thorax are all made from the same bunch of fibers from a Marabou feather. The specimen in the tying sequence has black plastic bead-chain eyes that can be purchased in any craft or fabric store.You can also use very small steel bead-chain eyes. Damsel nymphs don't have black eyes so it's a good idea to paint the eyes olive if you want the fly to look as realistic as possible. I don't think that it makes that much difference to the fish, so I seldom take the time to paint them. Damsel nymphs swim like tiny minnows in and near underwater vegetation in lakes and ponds. Fish your nymph in the weeds and along weed lines where the fish are feeding on the real thing. The Marabou Damsel is not weighted so you need to allow enough time for it to sink. Often times fish will hit it on the sink or after the first twitch of the line. Cast the fly into the weeds or parallel to a weed line, let it sink to the appropriate depth, and retrieve it with short strips and pauses. Once the fly hits open water, pick it up and cast again. Clamp the hook in the vice, crimp the barb, and start the thread. Lay down a base of thread from the hook's eye back to the hook's bend. Cut a three-inch piece of V-Rib, align it with the front of the thread wraps, and bind it to the hook's shank as shown. 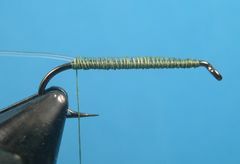 Tie in the plastic bead-chain eyes at the front of the hook with figure-eight wraps. Select a Marabou feather. Strip or cut off a bunch of fibers. 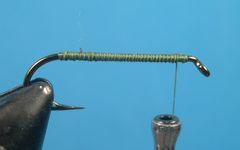 Then, tie in the bunch two-thirds of the way up the hook's shank, with the tail extending one-half the length of the hook's shank beyond the hook's bend. Wrap the V-Rib forward to the hanging thread, binding down the Marabou fibers to form the abdomen. Tie down the V-Rib and remove any excess. 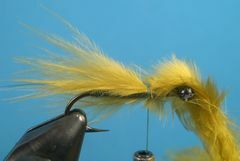 Continue binding down the Marabou fibers, with the tying thread, through the thorax area up to the eyes. Move the thread back to the base of the thorax where you tied down the V-Rib and tie in ten to twelve Pheasant tail fibers for the wing case. Wrap the remaining Marabou fibers in the throax area, using as much of the Marabou as you can to create a full, thick, thorax. Tie the Marabou off behind the eyes and remove the excess. Pull the wing case (Pheasant fibers) over the thorax and bind the fibers down behind the eyes with three or four wraps of the tying thread. 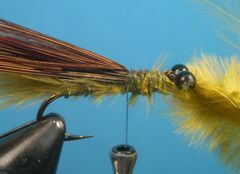 Move the tying thread in front of the eyes. Then, pull the thorax material over and between the eyes and tie it down at the hook's eye. Remove the excess wing case material. Form a neat thread head. Tie off the thread with a whip finish or a couple of half-hitches and apply head cement. Your Marabou Damsel is finished.